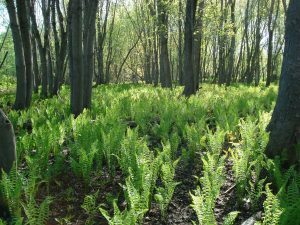 Edible Wild Spring Greens: Fiddleheads and More! Take a soil test if you haven’t already done it. Taking a good sample is critical to obtaining a good assessment; find good recommendations for sampling soil in Bulletin #2286, Testing Your Soil. Amend the soil if you have recommendations from last fall’s soil testing. You can add lime, organic fertilizers and slow-release fertilizer as soon as you can work the soil. Plant! 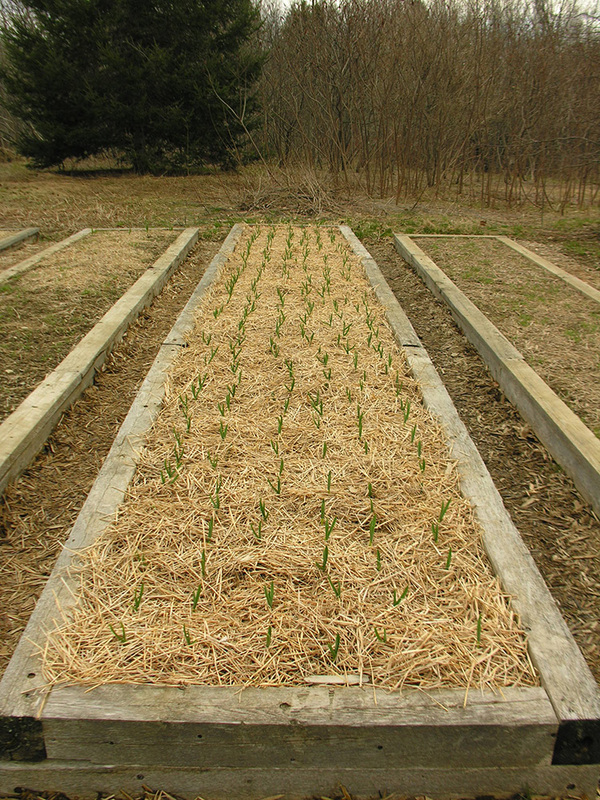 Starting in mid-April, sow seeds of beets, carrots, leaf lettuce, head lettuce, peas, spinach, onions, and parsnips. You can also plant onion sets. Carrots, beets and parsnips germinate a bit more slowly than the others listed above. Scatter a few radish seeds in those rows. Radish seeds germinate quickly. They’ll mark your rows, and you’ll have an early harvest without dedicating a row to this quick crop. In the last week of the month, transplant seedlings of broccoli, cabbage, Brussels sprouts. Cover them with row cover; it will protect the plants from late frosts, and you’ll be a step ahead of managing flea beetles. Wait until May to plant cauliflower. 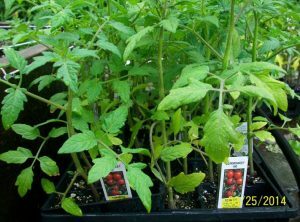 Start tomatoes indoors, but wait until the second half of the month, when light is higher and days are longer. Your tomatoes will be more compact and sturdy. If you ordered asparagus, plant it as soon as it arrives. You still have time to order asparagus (and other plants) from our “Grow It Right!” Benefit Plant Sale. If you plan to plant part of your garden with a season-long cover crop, you can sow oat-pea-vetch mix now, to incorporate into the soil in late summer. Rake off any branches, old leaves, and other litter, before growth begins. Check established perennial as the soil thaws. “Step in” those that have heaved out of the ground with frost. Cut back any ornamental grasses you left in place for winter interest. 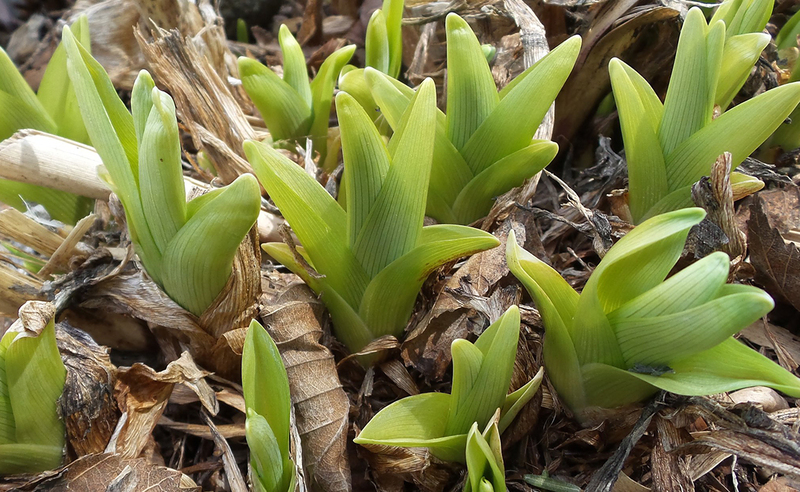 If you cut them back before new growth emerges, the clump will be sturdier. If you wait too long to cut back the old stems and leaves, you’ll likely snip off the tips of new leaves. Cut back other perennials you left in place for winter interest or bird feeding, such as rudbeckias and sedums. Divide and transplant perennials. April is the best time for this, as plants can be divided, planted, and left on their own in the cool moist soil and cool air temperatures. There’s no wilting, and no need for watering! Assess the garden, and make a list of plants to buy this spring. 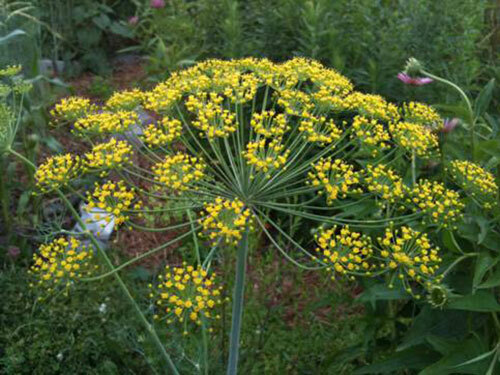 May is the best time to shop for perennials, as the selection is at its peak then. Wait until the soil is dry before edging gardens. Take the lawnmower to a professional for a tune-up. Don’t wait until it’s time to mow. Finish pruning before buds swell. After this winter, this task should keep you busy all month! Managing that first population of weeds makes weeding easier later in the season. Perennial and biennial weeds with taproots, like dandelions and evening primrose, heave out of the ground as the frost wanes. They’re easiest to pull at this time of year. Plant bare-root trees and shrubs promptly after you receive them. Prune off broken roots. Soak rootballs overnight in a bucket of water to start the hydration process. Dig planting holes as deep as the root systems, and as wide as necessary to be able to plant without bending roots. Assess your needs for trees and shrubs. Woody plants are expected to be in short supply in 2015 … have your list ready when you head off to the garden center in May! 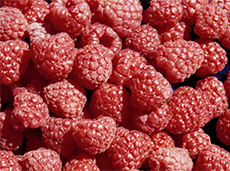 Purchase raspberries, blackberries, rhubarb, asparagus, several varieties of blueberries, and strawberries through the “Grow It Right!” Benefit Plant Sale. Proceeds from the sale will help support a variety of Master Gardener Volunteer projects and scholarships throughout the State of Maine. The deadline to order is May 1, 2015. These plants might be a good gift item for Mother’s Day, birthdays, weddings or special occasions. To learn about planting, growing, and harvesting your plants, visit Grow It Right! Dill. Photo by Kate Garland. Interest in edible landscapes continues as more gardeners want to take advantage of food cost savings while also having local fresh foods readily available to them. Another reason might be that recently developed or available edible varieties have been bred so that their flowers, foliage, and even their fruit are as attractive as the flower garden ornamentals. As is the case with any new garden endeavor it is suggested that you start in slowly to learn how including edible varieties in your landscape can be accomplished in an acceptable manner. 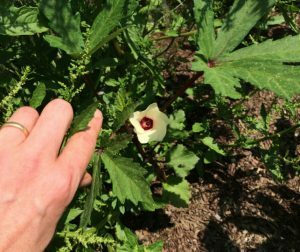 One of the longtime authorities in edible landscaping, Rosalind Creasy, suggests you start with edible plants that have high value and have the potential to look “ornamental” in your garden. This can include a number of herbs (purple basil, chives, broadleaf parsley, variegated sage) and the more unusual varieties of tomatoes (yellow or orange cherry tomatoes or multi-colored or untraditional shaped fruits). Rosalind’s Edible Landscaping website contains very helpful lists of common edible landscape plants for various planting zones, including zones 3 through 5. For a more brief explanation of edible landscaping and plants that are typically used in this approach, please refer to Edible Landscaping (PDF) by the University of Oregon or Edible Landscaping from Ohio State University Extension. Edible plants in a decorative container. Photo by Peter Bastien. In the same way that the wide variety of flower shapes, size and color along with mixing hardscape textures (such as adding logs, stone, driftwood and garden sculptures) in your gardens can add interest, edible plants can add visual diversity, talking points and help make your landscape come to the kitchen counter. Imagine a short row of bright red cayenne peppers behind a border planting white alyssum or a series of varying sized terra-cotta pots filled with everlasting strawberries set behind a bed of dusty miller. You can add elevation by including a trellis with deep purple, elongated beans, or Asian cucumbers. Higher in elevation one can not only add apples, pears and plums but don’t forget peaches, cherries, mulberry, apricots, or elderberry. To avoid over-shading of the garden consider using dwarf varieties. Highbush blueberries have changing appearance throughout the garden season starting with the bright small white flowers of early summer moving to a the deep blue-purple berries of midsummer and ending with the reddish hues of fall foliage similar to that of a burning bush. If you are trying to envision how to bring forward colors in your garden with edible plants, or for any flower and foliage combinations, take look at Introduction to Color from Cornell University. This website helps to explain how colors appeal to us, developing color combinations, and working with color variety. To develop garden texture in your garden using edible plants, consider adding plants such as purple, savoy cabbage, a border of miniature red kale or the seemingly endless variety of shapes and colors of eggplants available. Every summer, Reeser Manley and I conduct a different mini-experiment in our backyard garden. 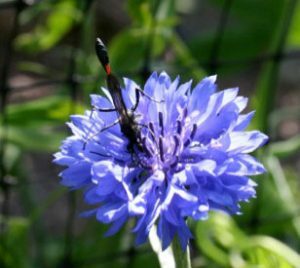 Last summer, we reviewed countless lists of plants recommended for attracting garden pollinators and other beneficial insects, selecting eight of the most frequently mentioned annuals, potting them in containers (calling them “a movable feast” for beneficial insects), and placing them about the garden. We made daily observations of these plants, documenting which insects came to visit each species. Identifying tiny native solitary bees, parasitic wasps, and flies is a challenge even to a trained entomologist. For us, it was a fascinating learning experience that revealed an incredibly intricate web of life in the garden. Pollinators, predators, parasitic, and plant-munching insects (herbivores); we quietly stood and watched them all. 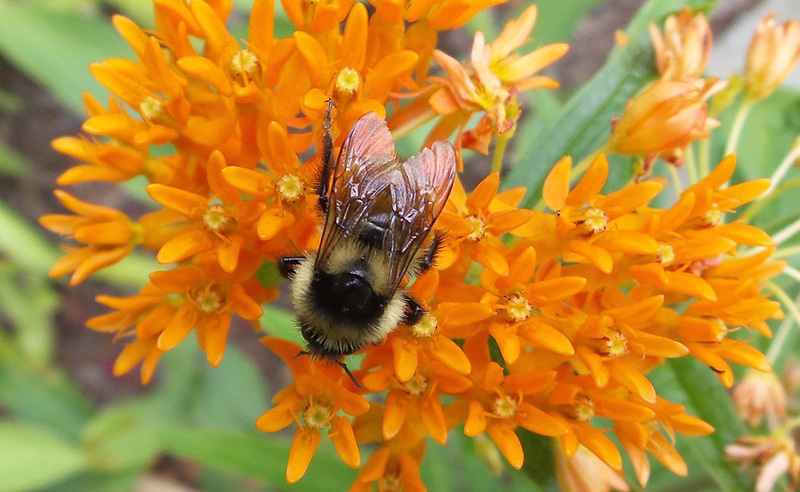 When all was said and done, five annual plants stood out as the best among those we trialed for attracting pollinators and other beneficial insects. Silver Spotted Skipper on Lobelia erinus. Photo by Reeser Manley. Lobelia erinus attracted a large diversity of insects, including hoverflies (insects that as adults feed on nectar but whose larvae prey on soft bodied insects such as aphids and whiteflies); bumble bee moths (mimics of bumble bees); several species of true bumble bees; butterflies such as the silver-spotted skipper and Eastern tiger swallowtail; and several species of native solitary bees. One of the nice things about lobelia is that it doesn’t need deadheading. In a partly shady spot, it just keeps going on its own, throughout the summer and into the fall. Thead-waisted wasp on Centaurea cyanus. Photo by Reeser Manley. The annual bachelor’s buttons (also called cornflower) was also frequently visited by pollinators, including bumble bees, native solitary bees, honeybees, hoverflies, and butterflies. We grew our plants from seeds started in early May and transplanted the seedlings to pots in mid-June. The first purple-blue, pink, and white flowers appeared in early July and the frequently deadheaded plants continued to flower on 2- to 3-foot tall stems throughout the summer. When we stopped deadheading, the last crop of flowers provided seeds that fed goldfinches and other garden birds. Bumble bee on cosmos bipinnatus. Photo by Reeser Manley. Cosmos is both the common name and the genus name for an extensive variety of flowering annuals. Our favorite group is the Sensation series, tall (4-5 feet) plants with large 3-4 inch daisy-like blossoms with yellow centers. We grew it from seed, ending up with plants that bloomed in various shades of red, pink, and white. These are among the tallest of cosmos, and are somewhat challenging to grow in a pot, requiring daily watering, deadheading, and staking. 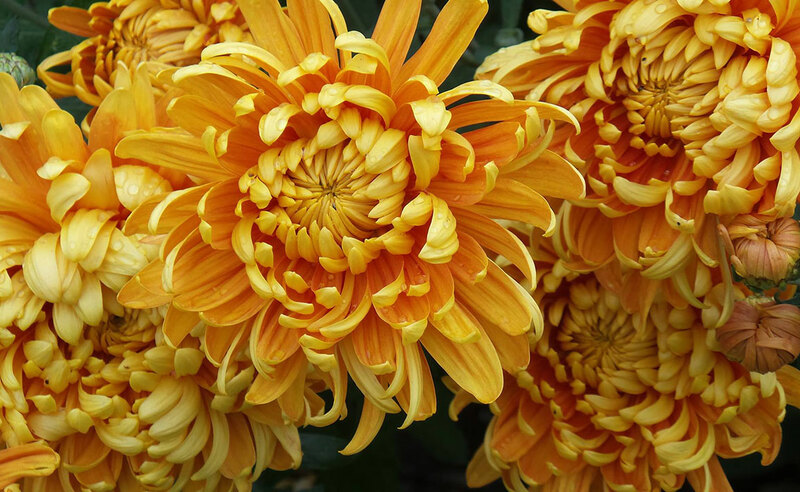 We also grew the Bright Lights series, multi-branched plants that grow 3-4 feet tall with semi-double flowers in shades of scarlet-orange, golden-orange, gold, and yellow. 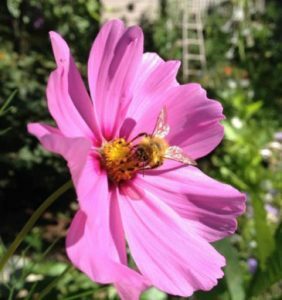 Throughout July and August, bumble bees, native solitary bees, and the occasional butterfly were the primary pollinators visiting our cosmos plantings. Native Solitary bee on Calendula officinalis. Photo by Reeser Manley. Calendulas, or pot marigolds, are a must annual for anyone interested in attracting pollinators to the garden. Once you grow calendulas in your garden, you will always have them. Plants in pots or in the ground will scatter seeds over a wide area and the following spring their bright green strap-like seedlings will pop up everywhere. We leave them to grow along the bed edges of the vegetable garden and transplant those that are in the beds to pots. 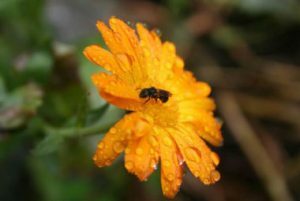 Wherever they are grown, the daisy-like bright yellow to deep orange blossoms which brighten the garden from mid-summer into fall are a favorite of the small native solitary bees. 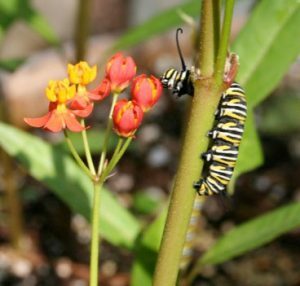 Monarch Caterpillar on Asclepias curassavica. Photo by Reeser Manley. Last summer, for the first time in its 15 year history, our garden was host to monarch butterflies. 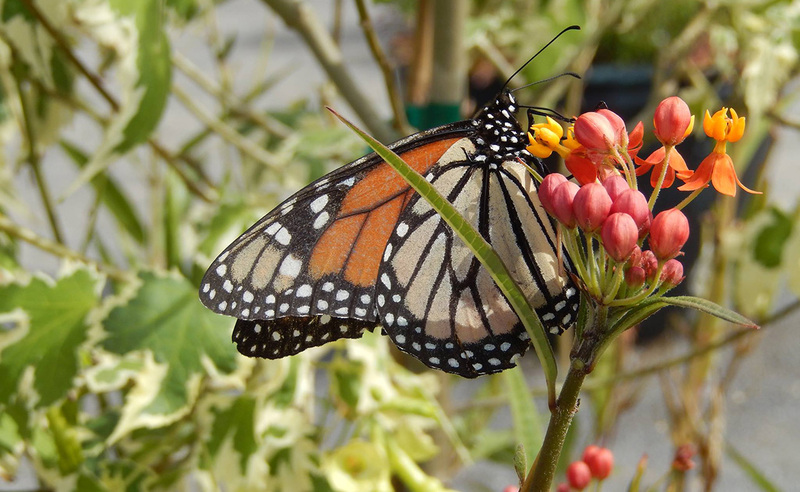 We briefly spotted only two adult monarchs winging over the garden in mid-June, never alighting on the milkweed, but the busy gardener does not always notice the pivotal events that change the character of both garden and gardener for the rest of the season. 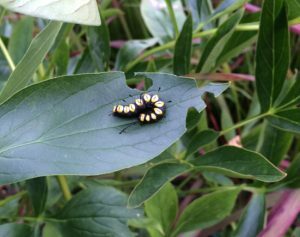 For on July 24 we came across the first monarch caterpillar, less than an inch long, feeding on the leaves of the annual milkweed plant that we had grown from seed. As they quickly became larger, the caterpillars were more visible. By July 27, we counted a total of 19. By August 1, we found 25 and, on August 4, they began to pupate, constructing chrysalises throughout the garden. Watching an adult monarch emerge from its chrysalis is a sight to behold. Plant it and they will come. With the objective of attracting native beneficial insects to our garden, this handful of annuals, all well adapted to container culture, are the ones we will continue to grow. A young visitor to the garden watches an even younger visitor from the garden! Photo by Jonathan Foster. For over 20 years, the northeast corner of UMaine’s Rogers Farm Forage and Crop Research Facility has been home to the Penobscot County Master Gardener Demonstration Garden, where three dozen different themed plots showcase a dazzling variety of ornamental annual and perennial collections, and where extensive vegetable space is worked for the Maine Harvest for Hunger. In 2014, over 50 Master Gardeners and community volunteers labored joyfully to continue the garden’s legacy of educational outreach, volunteer advocacy, and food production and donation to the less fortunate. 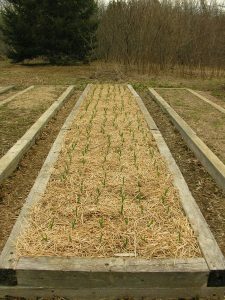 While the gardening interests of individual plot managers are as widely variable as any other cross section of plant enthusiasts, this community is unified in their passionate approach to showing the public how responsible, sustainable gardening practices can be used to raise crops for both practical and aesthetic purposes. 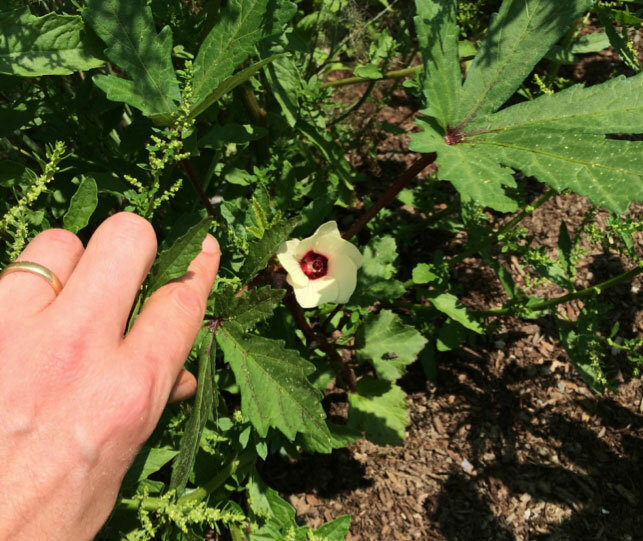 Okra in flower in Master Gardener John Hackney’s plot at the Demonstration Garden. Okra, tomatillos, artichokes, and Egyptian walking onions were among the nontraditional and unexpected offerings grown under the “Multicultural Family of Four” theme. Photo by Jonathan Foster. 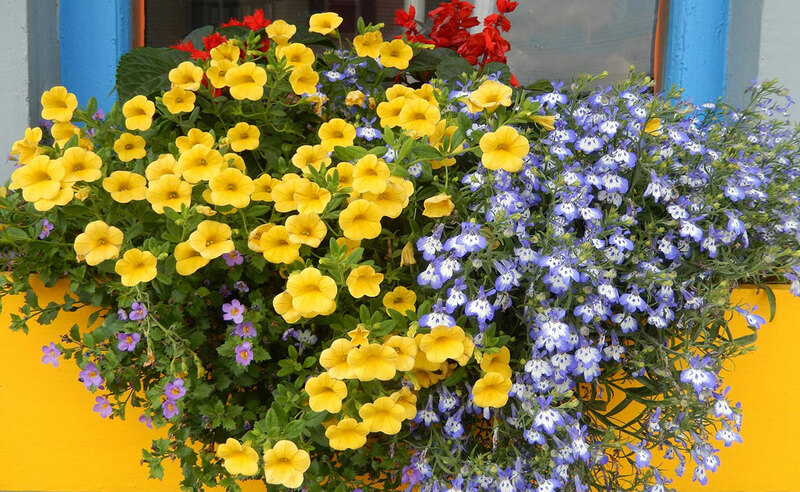 Traditionally, the current year’s Master Gardener class tackles the responsibility of managing the high-visibility front bed, using the prominent space to intrigue and attract visitors and passersby alike. Last season, the theme of recycling common items for garden use — trellises made of old ladders, wagon wheels, and axles — formed the architectural backbone for climbing herbs, vegetables, and flowers. Established plots from previous years resumed, including the Moon Garden, Colonial Kitchen Garden, Eco-Garden, the Pollinator Demonstration Garden, All-American Selections Garden, Dye Garden, Meditation Garden, and Hummingbird Garden, among others. 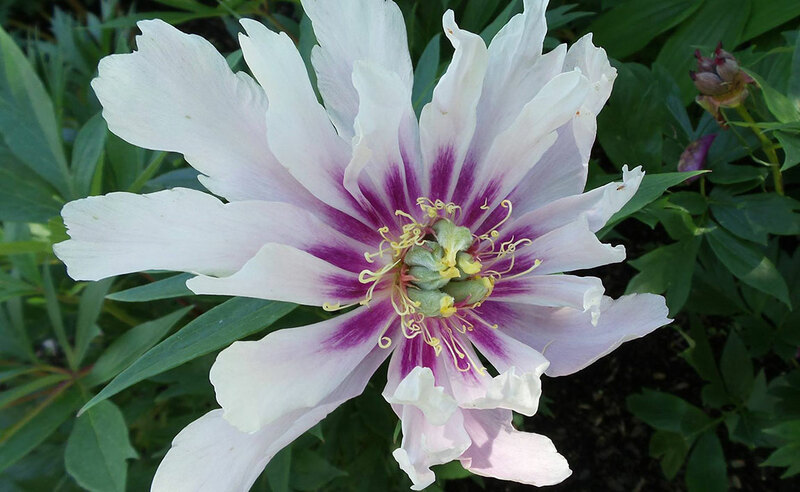 The peony, iris, cranberry, and blueberry beds were restored with fresh manure and mulch, yielding beautiful (and, in some cases, delicious) results. At the back end of the garden and across Bennoch Road, the workhorse plots dedicated to the Maine Harvest for Hunger produced donation crops (e.g., asparagus, rhubarb, lettuce, summer and winter squash, beets, cabbage, turnips, tomatoes, cucumbers, etc.) in excess of 5000 lbs. for the season. A paddle caterpillar, Acronicta funeralis, and its lunch in Master Gardener Karen Conlon’s Karesansui Meditation Garden. The Demonstration Garden is always full of learning opportunities, both exciting and exasperating! Photo by Jonathan Foster. Bountiful plants, creative design, and a fervent community, however, aren’t sufficient to fulfill the Master Gardener mission in the Demonstration Garden — outreach and education are crucial components to achieving the end goals of bringing the public into sustainable gardening. To that end, Tuesday garden work nights are open to the public and advertised as “Ask a Master Gardener!” opportunities for those who have specific questions about their own backyard efforts, who want to see dedicated plot managers at work, or who just want to visit with likeminded souls about a common interest. 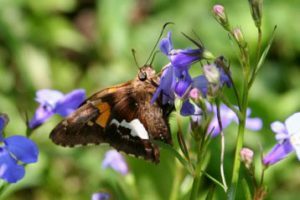 Additionally, several times per season, the Master Gardeners sponsor lectures, workshops, or field events with recognized experts in various fields to address popular topics in the gardening community like gardening on small budgets or working with woodland plants, or to raise awareness of important issues like native plantings and threats to pollinators. These events are always free to the public and advertised in regional media outlets. 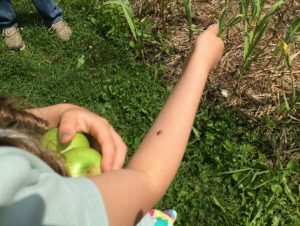 Finally, guided garden tours are available to groups with a bit of advanced notice — last year’s visitors ranged from the youngsters of the All-Saints School summer program to the experienced senior gardeners of the Bangor Nature Club. Or ad hoc tours can be arranged on the spur of the moment if you can grab a Master Gardener with a few moments to spare! Regardless, the garden is always open to the public during daylight hours in the growing season. 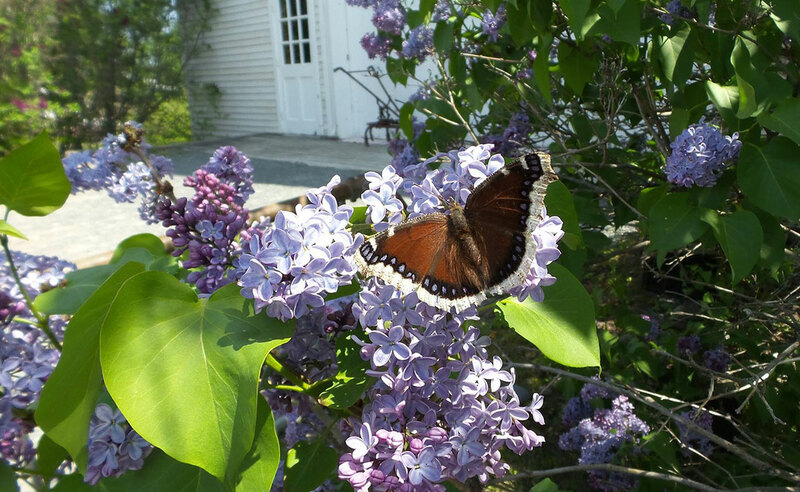 The Demonstration Garden is overseen by the UMaine Extension in Penobscot County, which provides material support, logistical planning, and a repository of gardening information for the Master Gardeners and associated volunteers. Any Master Gardener or community volunteer who wishes to get involved at Rogers Farm can do so by completing safety training and orientation. Information on both is readily available from Kate Garland (katherine.garland@maine.edu) or Jonathan Foster (james.j.foster@maine.edu) at 207.942.7396. Spring greens and fiddleheads are early edible treats in Maine. These foods are a pleasure to enjoy in your favorite recipes. Enthusiastic gardeners can get an early start harvesting spring greens that may come up right in their backyard. These greens are nutritious — high in vitamin A, vitamin C and iron. They’re also low in calories, fat and cholesterol. Plus, wild greens are widely available and require no work at all — except harvesting! As with any green, the younger the plant, the more tender it is. For the safest crop, be sure to pick greens well away from major roads or other chemically treated areas, and wash the greens well before you use them. For information and recipes on how to use edible wild spring greens, see Bulletin #4060, Facts on Edible Wild Greens in Maine. Fiddleheads, an early spring delicacy throughout their range, are the young coiled fronds of the ostrich fern (Matteuccia struthiopteris). Many people mark the arrival of spring with a fiddlehead picking outing. Some important food safety advice for fiddlehead consumers: The Center for Disease Control and Prevention (CDC) has investigated a number of outbreaks of food-borne illness associated with fiddleheads. 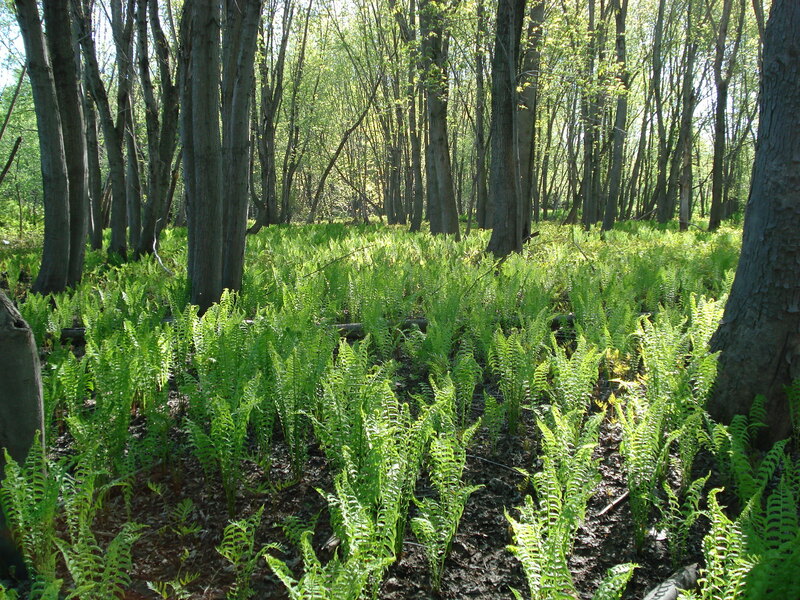 The implicated ferns were eaten either raw or lightly cooked (sautéed, parboiled or microwaved). The findings of this investigation recommend that you should cook fiddleheads thoroughly before eating (boil them for at least 10 minutes). 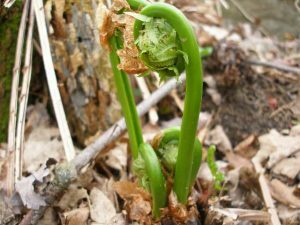 For information and recipes on how to use, store and preserve (freezing and pickling) fiddleheads, see Bulletin #4198, Facts on Fiddleheads. 2015 Master Food Preserver Applications available! The application deadline is May 1, 2015 with selection status announced by May 22, 2015. Master Food Preserver Volunteers serve to extend UMaine Extension’s education programs in food preservation to adults and youth. Program includes 10 three-hour kitchen lab sessions from June – September in Falmouth and Gorham focusing on food preservation including canning, drying, freezing, fermenting and winter storage techniques. After successful completion of the program, graduates serve at least 20 hrs as Master Food Preserver volunteer resources in the community to provide the public with research-based information from UMaine Extension and USDA. Learn more or apply. Visit your favorite local greenhouse or nursery to help celebrate the joys of gardening in Maine. 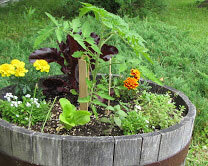 They garden where you garden and love to share their experiences and their expertise. Get the best advice on plant varieties and gardening tips for your area. 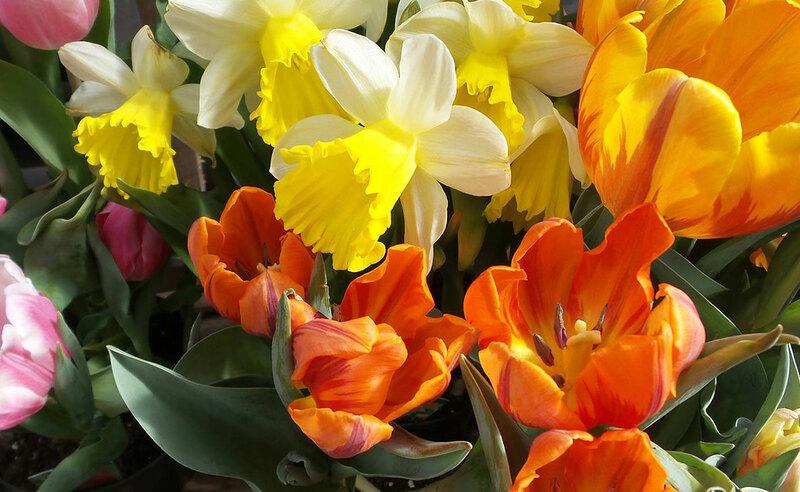 Check with your favorite local greenhouse or nursery for their schedule of events and offers for the day.